Last year, Cyber Monday was the biggest single online shopping day on record. Consumers spent $1.25 billion online that day. That’s a whole lotta moolah. And guess what? This year, they’re expected to spend even more. 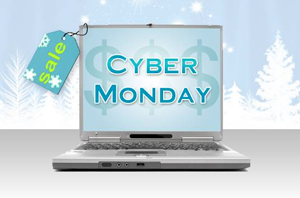 It’s no doubt that Cyber Monday is an exciting day for eCommerce sellers. It’s one that many online retailers see as the official kickoff to the holiday season. So to help you get the most fulfillment, joy and satisfaction as possible, we wanted to offer a few Cyber Monday selling tips. 1. What’s the big deal? If you have multiple audience segments, consider multiple deals. For instance, a marketing campaign promoting your higher end products should have a different offer than a campaign promoting lower end items. There’s no such thing as one great offer for all of your customers. If you’re active in social media, consider offering exclusive deals to your Facebook fans and Twitter followers. After all, this is probably one of the reasons they’re following your brand, and it’s certainly something they’ll appreciate. People have short attention spans. So make sure that you don’t have a “one and done” approach when it comes to promoting your Cyber Monday deals. Start advertising your deals ahead of time, remind consumers as the date approaches, and right as it begins. Also consider audience-specific deals and personalize emails and advertising messages as much as you can. It’s a good idea to think beyond free shipping. More and more, eCommerce shoppers are expecting free shipping, and while it can get you over one hurdle, on Cyber Monday, you’ll likely have to bring a little more to the table in order to get the sale. Try to get creative with your Cyber Monday deals, and think about ways to build repeat customers and purchases, such as offering gift cards, or by creating a membership club in which customers get exclusive deals throughout the year. The reason Cyber Monday is such a popular online shopping day is that people can get killer deals…so make sure you have one. The other thing to consider, which I felt was deserving of it’s own headline, is giving your deals a deadline (rhyming this that line was unintentional). On Cyber Monday, people go online to buy, not just to browse, so take advantage of this by making your promotions time sensitive. For instance, make your half off discount valid until midnight that day. You can take it a step further by giving people an early bird discount, one that’s valid only until 9:00 am, as many people are up way too early trying to get the best deal. One other option that has become increasingly popular, and for good reason, is to offer deals that only go into effect if enough people have committed to the purchase. For example, online shoppers can buy that killer 12-cup programmable stainless steel coffee maker with a burr grinder for only $100, but only if 50 people commit to the deal. With this approach, eCommerce shoppers can fulfill those deals by announcing them to friends and family, which means…..(drum roll here)……free marketing! So you spend all this time coming up with the perfect Cyber Monday deals, only to have your hopes and dreams horribly crushed into permanent oblivion because nobody hears about them. The important thing to remember is that there will be ton of retailers vying for consumers’ attention that day (and for the coming weeks). And while a little creativity can really help to cost effectively build awareness, it’s a also good idea to ramp up your ad budget, as long as you set goals that correspond with that increased budget. The huge shopping frenzy combined with all of the one-day deals can easily make Cyber Monday overwhelming for eCommerce sellers. And for smart sellers, they’re thinking beyond this one day, and even beyond the holiday season…..they’re viewing Cyber Monday as a catalyst to generate long-term customers, which means they’re thinking beyond the “checkout” button. Leading up to Cyber Monday, in addition to making sure you can handle traffic spikes on your website, make sure you’re prepared to handle the order fulfillment rush, meaning you have enough inventory, supplies and staff. If you use an outsourced fulfillment company, like eFulfillment Service, make sure to coordinate inbound freight shipments and discuss any special project needs, such as kitting, which can save you money on order fulfillment. Historically, Black Friday has been the biggest shopping day of the year for brick-and-mortar retailers. But as online shopping continues to grow, many consumers are spending their Friday after Thanksgiving shopping in the warmth and comfort of their own homes. In fact, online spending increased 26% on Black Friday last year, and it’s projected that we could see similar growth this year, bringing the total online consumer spend to over $1 billion that day. This year, don’t wait until Cyber Monday to try to reel in buyers with special discounts….get started early and reap the rewards. We hope you have wonderful and prosperous holiday season!